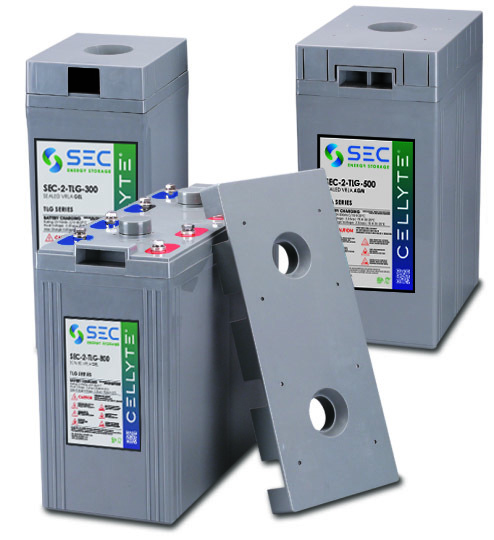 The SEC Cellyte 2TLG series of VRLA Gel 2Volts builds on the Cellyte TLA platform utilising the same classic top terminal construction. They were designed for when a cost effective but reliable solution is required. In addition though, the design features true thixotropic gelled electrolyte to improve cycling capability, which, combined with the thick lead calcium grids, gives a robust product with a reputation for rugged reliability. The resulting range is a perfect for all deep cycle applications including off-grid telecom, renewable energy, mobility, emergency lighting, marine and semi-traction. The Cellyte 2TLG range is manufactured in SEC’s ISO approved factories and is backed by a full 2 year warranty as standard.